This one is from Beth Twist. "I have stitched dozens of samplers, but have never stitched my own name in, or the actual date, so this time I did... I'm not sure how I will finish it off just yet. I hope you like my "translation", I followed the chart for the design, but chose to let my threads do the talking, and only switched colors when a thread ended, with the exception of little Miss Bird, who simply needed to be striped! I think the linen is Zwiegart in a natural, and probably 28 count, but I'm not sure (I really should label my stash linens). I used DMC 221 for the dark red, WDW Raspberry for the medium, and WDW Red Pear for the light." Beth I'm so glad you added your name to a sampler. At first I thought ....I can't believe she hasn't added her name to a sampler!!! But the more I thought about it I thought....heck I haven't either. I usually put an A or maybe AA. Now I think I'm going to have to do one with my full name too. You are entered into the contest. I love the little box with the tulip in your picture Beth. I know everyone here is going to want one. Is this a pattern? Is it needle punch? You are going to have to leave a comment because inquiring minds want to know. For those of you looking at this for the first time check the April 14th post for contest details. More later dear friends! My bags are packed and I'm off to bed. Beautiful! I love the colors and the little bird is perfect. Have a good and safe trip Alma. You're almost making me want to crosstitch with these awesome patterns. Almost. I seem to be pretty busy as is. :) But your stitching and photography are great as usual. What a wonderful interpretation by Beth (and such a lovely name - Beth Twist, it's perfect for a sampler :>) I love those delicate colours. I wanted to add my comment quickly as I see you've already got an Angela and an Angie so I thought we Angela's should stick together...haha! It looks beautiful! I was going to stitch my full name on my sampler as well, then I saw the first post and liked the idea of my Grandma's name stitched on there as a memorial. I haven't done either yet, and all this creativity is making it hard to decide! Love the bird. So cleaver. I'm enjoying seeing these beautiful interpretations of the sampler! It's giving me lots of ideas for mine. :) Have a safe, wonderful trip! ohh well, there is another Angela who is working on this antique sampler! I'm from Italy and where are the other Angela, Angie etc. from? Thanks for all the kind comments, ladies! And thank you for sharing my finish on your blog. The little wooden quail was hand-carved by my friend's father, and the tiny skeleton key belonged to my Grandmother. Love Beth's stitching! 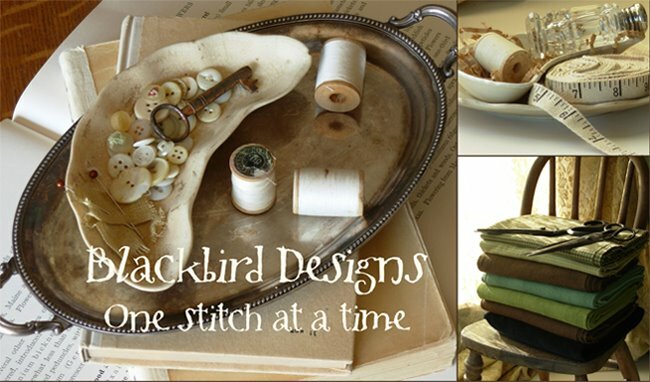 She is awesome at stitchin' ~ always! OMG, that's so beautiful, Beth!! I love the colors you chose. So beautiful! Really like it in these colors! Beautiful work! I love these colors! Alma, can you tell me is it necessary to stitch our real name to the sampler, please? My real name is too long, so I desided I'll stitch my nickname... Can I be entered to the contest if I am stitching only my nickname? Your nick name will be just fine! A beautiful sampler from Beth well done! All of these samplers are so beautifully done!! These samplers are stitched beautifully. I am hoping to complete mine but I think I am going to run out of time, I will definitly be finishing it, fingers crossed I will be in time. Beth did a beautiful job on her little sampler. I've got a question not related to that pretty sampler. I saw a picture of the most gorgeous Blackbird Designs quilt taken by a French reader/blogger/stitcher. The quilt hangs next to the little single beds and it's a huge appliqued sampler with houses! I love it!! I'm not much of a quilter, but there's a good reason to start. Is that pattern available? I'd love to purchase it! Just found your blog and love it! 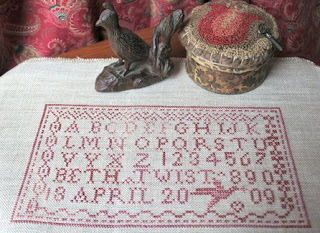 This sampler by Beth is beautiful. I love the reds too! Thanks for the great designs and now a wonderful blog to boot! France this month so your trip was very interesting to me. I just found your blog, I am a great admirer of your designs! Please enter me in your contest.